According to the needs and the degree of humidity, fans transport air from the bathroom, kitchen, or laundry room to the outside or in air ducts. This will create in the living area a slight vacuum. Because of this underpressure flows fresh and filtered air through supply air elements in the living room, bedroom, children's room and study rooms. Special attention is given to the humidity-controlled ventilation systems. These officially approved systems can reduce the loss of heat energy in accordance with the energy-saving considerable extent. Needs-driven regulation of the Silvento exhaust air fans has been fitted with a humidity-/temperature sensor. This innovative regulation adjusts the fan stage automatically to the ventilation requirements: the air flow increases or decreases depending on the relative humidity. This ensures that as much ventilation is made as required and as little as possible. The sensor integrated in the suction section of the exhaust air fan records the temperature as well as the humidity content of the exhaust air flow. Since the fan is installed in the bathroom or WC where different room air conditions arise compared to the living room areas, the simultaneous evaluation of temperature and humidity ensures ventilation (step 1 to 4) adjusted to the room air conditions in the living room areas. Therefore, this control not only considers the requirements in the bathroom, but also the needs in the living room area and provides effective protection against moisture damage and mold formation. The automatic seasonal time switch adjusts the fan automatically to the lowest stage in summer and back to humidity control in the transition period and winter season. 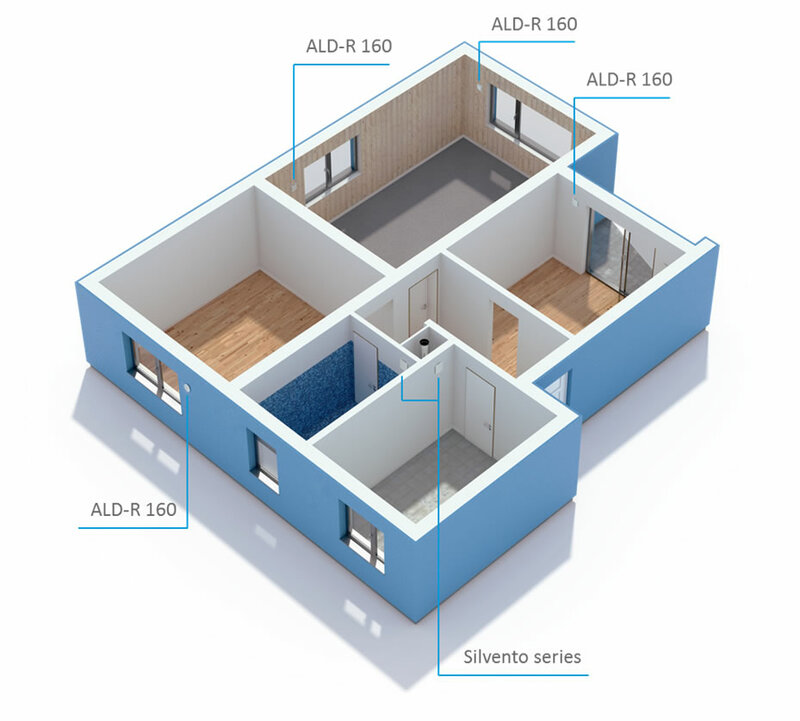 The 160 modular system makes it easier to plan and implement hybrid ventilation. If the Silvento series does not have to be included in planning, you can use the same installation tube for each ventilation unit of your building project. The exhaust air series Silvento is used for bathrooms and kitchens without windows in apartment buildings. The benefits of the hybrid combination are clear: while living room areas are equipped with the heat recovery device e², a lower priced exhaust air device can be used in classical exhaust air rooms such as the bathroom, WC or kitchen which is only used when needed. This is required by law for bathrooms and WCs without windows pursuant to DIN 18017-3. LUNOS ventilation systems with heat recovery can be applied everywhere. On account of the decentralized design, the individual ventilation devices can be installed exactly where you need them. Even combinations with classical exhaust air systems are possible and can be designed pursuant to EnEV and DIN 1946–6 using the LUNOS ventilation tool. With its new products AB 30/60 and RA 15-60, LUNOS provides an ideal enhancement to the 160 series in classical exhaust air rooms subjected to humidity, such as the bathroom, WC and the kitchen. With the aesthetic dreams of house and apartment owners in mind, engineers at LUNOS also focused on the design when developing the new fans. These fans present themselves like their ‘big brother’ e²: inside panel, filter and outside grille are from the same product family, whereby the RA 15-60 is more pressure-resistant than its alternative, the AB 30/60. 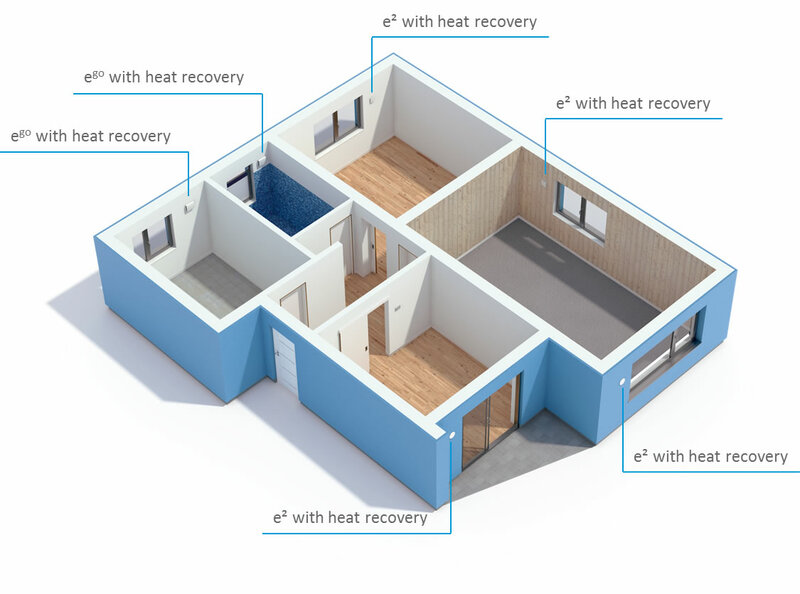 Via the ego, the e² can be used to optimum effect in a ventilation system with heat recovery. On account of the decentralized concept, the individual fans can be installed exactly where they are required. e² fans are used in living room areas, and two units are always in operation as pairs. Therefore, an even number of units must always be installed to ensure the units work properly. Functional rooms such as bathrooms and kitchens are ventilated via the ego. Operation in pairs is not required, since two ‘small’ e² in the ego ensure supply and exhaust air with heat recovery. The e² operates in accordance with the principle of the regenerative heat exchanger. A storage element charges in a similar way to a battery with heat energy in reversing operation and transfers the heat to the outside air supplied. The fan with heat recovery has a power consumption of just 1.4 Watts in base load operation (0.09 W/m3/h). The ego also operates in accordance with the principle of the regenerative heat exchanger. A storage element charges with heat as in the well-known e². However, this is distributed skillfully with two fans so that supply and exhaust air are provided simultaneously. A second device is not equired for operation. The system can also be switched to exhaust air mode in which a very high flow of 45 m³/h is discharged in order to enable fresh air to flow into the room quickly (e.g. WC or bathroom).